Each year, the global human population is producing and using massive amounts of plastic products (our combined weight in plastic was 322 million metric tons in 2015). Singleuse packaging is the largest sector of plastic use, and produces an enormous disposal and management problem. Plastics enter the ocean at rates equivalent to dumping a garbage truck of plastic every minute. This plastic persists for hundreds of years, and breaks down into smaller and smaller pieces. Plastic fibres, particles and compounds are showing up throughout marine foodwebs in plankton, birds and fish, and they have impacts at every level of these ecosystems. Beach clean ups are a good start – they clean up cigarette butts, flip-flops, bottle caps and pieces of water bottles and other containers – but don’t address the root problem of plastics reduction. At a recent panel discussion following the stunning film “Blue” organized by our friends at CPAWS BC, we promised to compile a list of resources and actions people can take to help secure better laws to stop plastics from entering the sea and get them out of the ocean. There are many actions individuals can take – from reducing your personal plastic consumption to preventing plastics from entering the marine environment. You can find some ideas in articles like this and this, and we encourage you to avoid #pointlessplastics and stealth microplastics. And we applaud businesses like Mountain Equipment Co-op, which hasn’t provided any plastic bags to customers since 2008. Elements of a comprehensive strategy to reduce plastic pollution to near zero. Source: Worm, Boris, et al. "Plastic as a persistent marine pollutant." Annual Review of Environment and Resources 42 (2017): 1-26. As an environmental law organization, our focus is on establishing laws to prevent and mitigate plastic pollution – and there are legal initiatives currently underway that need your support. Action from all levels of government is ramping up. Now’s the time to make change. Highlighted below are five key actions you can take to get binding laws in place to reduce ocean plastics. Cities can act on plastic pollution by bringing in bylaws to ban plastic bags, place fees on plastic and/or paper bags, or implement a combination of bag bans and fees to limit their use. Many places around the world have already done this. If you don’t have a city bylaw on plastic bags or other single-use plastics, you can start a campaign to get one passed. Recycling is not the best option. Plastics are notable for their low rates of recycling. One study estimates that in the US only 6% of plastic bags are recycled. There are currently eight Canadian cities that have introduced plastic bag bans: one in BC (Victoria), one in Alberta (Wood Buffalo), two in Manitoba (Leaf Rapids and Thompson) and four in Quebec (Huntingdon, Deux Montagnes, Brossard and Montreal – though Montreal's ban does not apply to thicker plastic bags). You can read details of those bylaws here. Litigation against municipal action on plastic bags is common in the US, and information resources on how to respond to litigation are helpful. Legal challenges from the plastics industry and retailers caused Toronto to retreat from a bag ban, and just this week, a plastic lobby group filed a court petition to overturn the City of Victoria’s new bag ban. This past fall, the City asked Vancouverites what City Council can do to reduce single-use items like plastic shopping bags, plastic water bottles, coffee cups, and disposable food packaging. The consultation paper noted the City has wide regulatory authority over this issue, including the power to prohibit businesses from distributing single-use packaging like shopping bags, disposable cups and take-out containers, and to prohibit single-use packaging from being disposed in the solid waste system. Send a letter to this address and copy Mayor and Councilors: City of Vancouver – Single-Use Item Reduction Strategy Consultation. 453 West 12th Avenue, Vancouver, BC V5Y 1V4. Below are some suggested points for your submission. A ban and fee on single-use bags. Second-generation plastic bag laws that combine elements of a ban plus fees on all types of singleuse grocery bags do work. The issue has been studied extensively – perceived negative effects of regulation can be avoided and lessons learned from the more than 140 cities in the US and growing number of Canadian cities that are acting. Follow the lead of other cities in Canada like Victoria and Montréal. Will they beat Vancouver as the greenest city? Ask the provincial government for an amendment to the Vancouver Charter to give the City the power to charge fees on plastic bag use, or ask the provincial government to legislate on this issue, making it applicable to all local governments. Set more ambitious targets for singleuse reductions. Set a shorter timeline of two years instead of the current suggested five-year targets, which include reducing the amount of disposable cups and take-out containers going to landfills/incinerators by 50%, and reducing the distribution of plastic and paper shopping bags by 70%. Include a goal for reduction of plastics into stormwater outfalls. In the US, LA County requires Southern California cities to reduce their trash contribution in select water bodies by 10% each year for 10 years with the goal of zero trash (see this report for more details). Look at the economic impact and success stories from around the world. In California, a combination of local ordinances and a state law has reduced plastic grocery bag litter by 72% since 2010. Bags now account for less than 1.5% of items littered, the CBC reports. In the UK, the 5p plastic bag charge has been an enormous success in changing consumer behaviour. According to the UK’s Department of Environment, Food and Rural Affairs, the charge has reduced use of these bags by 83% and has taken nine billion plastic bags out of circulation. Now Scotland has plans to match the EU’s pledge to make all plastic packaging reusable or recyclable by 2030 – and is using a plastics ban to get there. The BC government has the power to control waste and take more action, such as putting fees on single-use plastic bags. Citizens can write to the BC Minister of Environment and ask what action the government is taking on plastic waste. Mailing Address: PO Box 9047 Stn Pov Govt Rm 112, Parliament Buildings Victoria BC V8W9E2 CANADA. 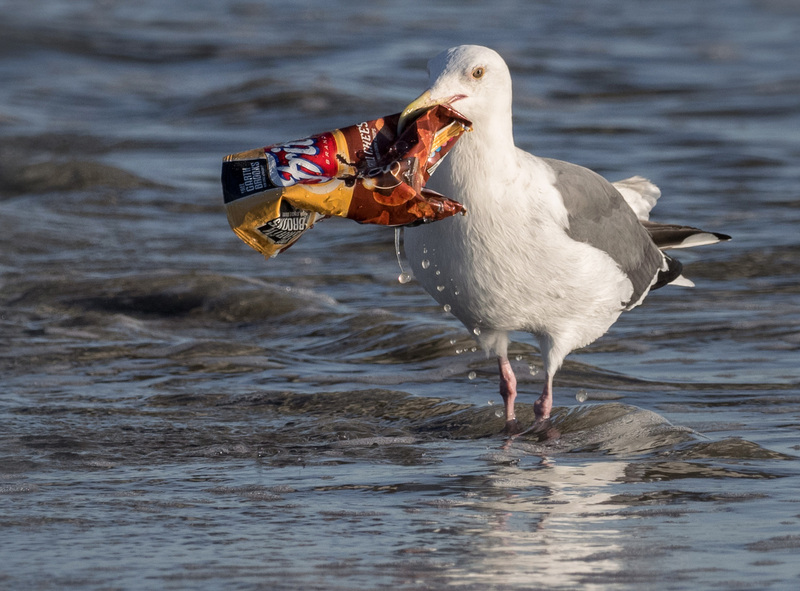 Vancouver Island MP Gord Johns presented a private members’ motion in Parliament last November calling for a national strategy to combat plastic pollution in and around aquatic environments, which would include important regulatory and funding measures. We have many ideas on what needs to be in this strategy. First, however, the government needs to commit to developing such a strategy. That’s where you come in. If you support this motion, you can sign a petition on the Parliamentary website. This petition calls on the Government of Canada to adopt Motion M-151, to establish a national strategy to combat plastic pollution, and to work with the provinces, municipalities, and Indigenous communities to develop a national strategy to combat plastic pollution in and around aquatic environments. The petition is open for signature until April 11, 2018, at 5:04 p.m.
5. Write your own environmental petition! Canadians can ask the federal government questions about plastics bans and fees by writing their own environmental petition to the Commissioner of the Environment and Sustainable Development. Unlike other petitions, these petitions do not need to contain multiple signatures. They act more like a letter to the federal government. Citizens may write an environmental petition, asking the government environmental questions, for example: why we do not have a national ban or fee on single-use plastics? review and improve an environmental law, regulation or policy. The federal government is required to respond to your petition within 120 days. There’s no doubt this is a complex problem, as plastics permeate every aspect of our lives. But we can take positive regulatory steps. New regulations that prohibit the manufacture, import and sale of personal toiletries that contain plastic microbeads, including bath and body products, skin cleansers and toothpaste, non-prescription drugs and natural health products came into effect this month. More action is needed, and Canada can take note of the numerous laws, taxes and levies, complete and partial bans, and codes of practice that exist in countries around the world (compiled here). See this recent blog about one community we are working with to reduce this scourge to marine life. A lawyer’s website devoted to the issue of plastic bag laws in the US, which includes a series of explanatory video clips. Canada has banned DDT, phased out lead from gasoline, phased out CFCs, improved global legal controls on mercury, developed a treaty to get rid of persistent organic pollutants, and is finally banning asbestos. It’s time to act on plastics too. But we need laws to get to zero plastics – and we need people like you to encourage your governments to take action on marine plastics.